Ss. 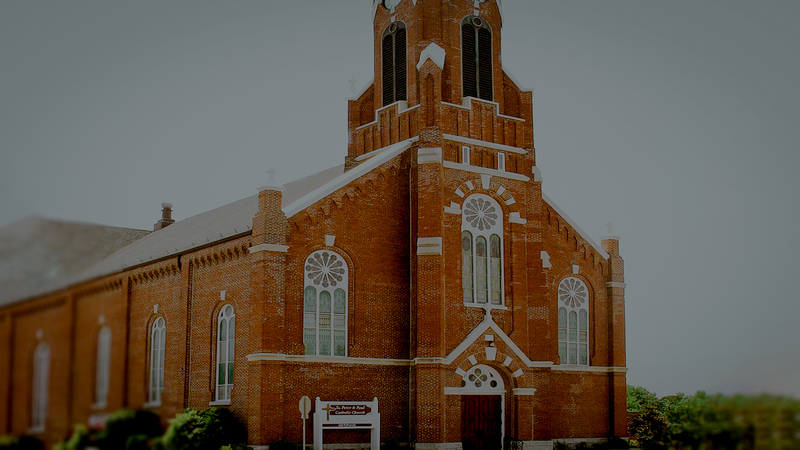 Peter and Paul Church has been bringing the good news to Waterloo for over 160 years. As a vibrant Roman Catholic parish we have committed ourselves to being "an active, welcoming and giving community that is open to change as needed for growth in our parish." We "encourage active participation throughout the parish" and we are committed "to grow in the love of God and to be the best community we can be." It's 1883. Eads Bridge was completed as the first bridge across the Mississippi river at St. Louis just nine years ago. Bell invented the telephone seven years ago, and Edison perfected the light bulb just four years ago. In two years, the first skyscraper, the Wainwright Building, will be completed in Saint Louis, a triumph of 19th-century engineering. Twenty-five miles south of St. Louis, the Catholic community of Saints Peter and Paul Parish complete the thirty-year construction of one of the largest churches in the then Alton diocese, a triumph of faith. 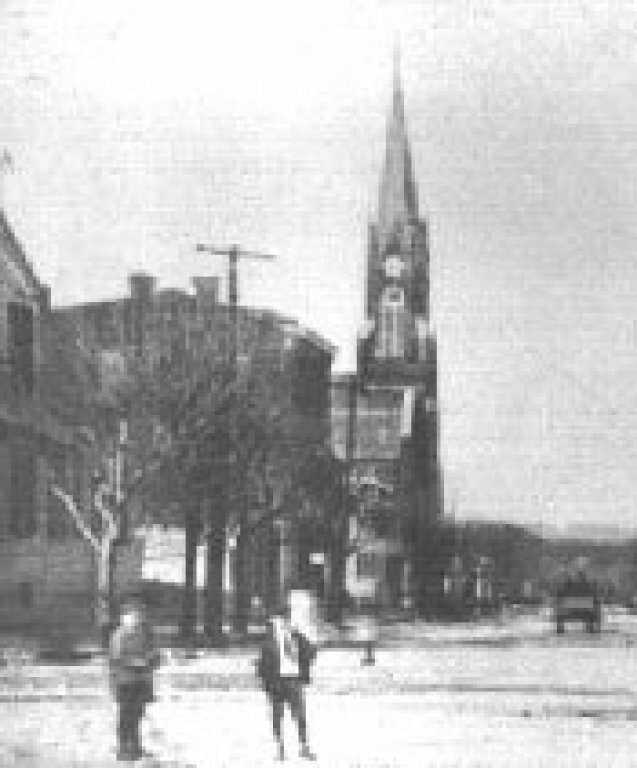 Church buildings have long been built as inspirational expressions of faith of the congregation. In the middle ages, major architectural advances were needed to build the great cathedrals of Europe. These buildings were designed to transport the believers from their earthly world to a heavenly one. Everything about the building pointed to the power and majesty of God and His relationship with mankind. Saints Peter and Paul Church, built in the latter half of the nineteenth century, shares a lot of design elements with the medieval cathedrals. Life in Waterloo in 1883 also had a lot in common with life in those times. Unpaved streets, and limited if any electricity or other conveniences, all heightened the contrast between the elegance of the church and coarseness of everyday life. Liturgically, too, things were closer to medieval Europe than current times. The Mass was recited in Latin by the priest, with his back toward the people. Particularly in the last 30 years, church construction, decoration, and liturgy have all been been demystified. Vatican II liturgical reforms now stress the community nature of worship, particularly in the Mass. Consequently, newer churches are often built more horizontally, reflecting this emphasis on congregation. Economics may also play a role in the flattening of churches, but there never was a time when large, tall buildings were the economical choice. In the 1960s and 70s, with emphasis on the Mass as the primary function of the building, ornate decorations were seen as distractions, and churches, old and new, became starkly simple in their decor. The great altars of the past were refashioned into simple tables where the Eucharistic Meal was prepared. The statues, pictures, and windows of the church are not merely decorations. Neither are they the focus of the liturgy. Christian symbols are not superstitious signs or good luck charms. They are there to put us in a frame of mind that is open to God, and to remind us of aspects of our Faith. The holiness of the enclosed space has to do with the activities that take place there, and the presence of our Lord in the Eucharist, rather than with the stained glass, statues, and paintings. Many cathedrals in Europe are little more than museums instead of centers of religious activity. Our church is consecrated by every Mass, baptism, wedding, and funeral which is held there. The interior of Saints Peter and Paul has changed over the years, reflecting the changing standards of the times. Thirty years after Vatican II, we are better able to mix the old with the new, and to appreciate both our heritage and the availability of the liturgy that the reforms have afforded us. The design elements restored with the recent rehabilitation are there to enrich our worship, and they can do that more effectively if we know something of the history and language of the symbols. After thirty years, some of the symbolism which was taken for granted in earlier times may not be be so familiar to current church goers.